The two wintry revenants, propped elbow to elbow in bed with their glowing babies, made a deep impression. The blanched gorgeousness of their outfits, blooded by the hot royal red of the christening gowns, was part of it. So was the spooky incongruity of vivid faces looking out from the picture's steam-ironed one-dimensionality, as though two people were standing behind it, sticking their heads through holes in the board. Mainly, though, it was their doubleness. I don’t know why I found this so interesting. I read the article and watched the video and then I found myself reading it more carefully a second time and then a third. 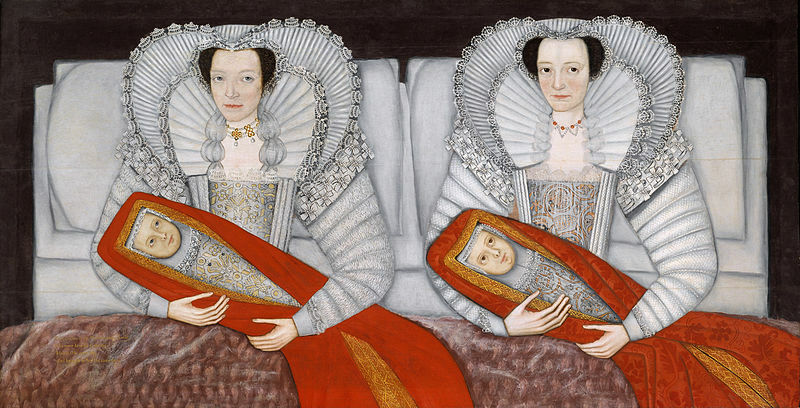 I wanted to know more about the Cholmondeley Ladies and the Lake sisters, who by the way, are adorable. For some reason the story tapped into one of those places in my imagination where strange and possibly magical things can happen. Thanks for sharing.